This week our stretch mark review is going to be taking a look at the Derma E Stretch Mark Creme. The Derma E Creme has undertaken vigorous trials and found that around 75% of those who used the product found their skin to be visibly improved. The product aims to make skin supple, and elastic, while simultaneously targeting discolouration commonly found with stretch marks. All of this is and more is claimed by this super natural cream, so read on to find out more. There is little inside that isn’t an active ingredient for one reason or another. All of the finest oils, butters, and plant extracts pack this formula with hydrating, and skin strengthening qualities. We would like to briefly mention Zemea. Zemea is the acting solvent which helps all of the other ingredients to blend and work together, and to find their way deep to the affected layers of skin. Zemea is an entirely new way of doing this without using anything unnatural, and really seems to be cutting edge in the cosmetic industry today. Derma E is a potent, yet balanced formula with all of the finest ingredients you can find in products aimed at relieving and protecting against stretch marks. There is no daily limit however, and this one can be used right through pregnancy. The price for a 4oz tube is incredible at under $20 direct from their site. You can also get 10% off when you buy more than one product at a time, as well as receiving free delivery. This is a real gem, a rare example of a more premium product without the premium price tag. Derma E supports each and every item they sell by offering a complete 100% money back guarantee if you’re not absolutely satisfied. The only catch is that the guarantee is only valid for 45 days, so beware of that. 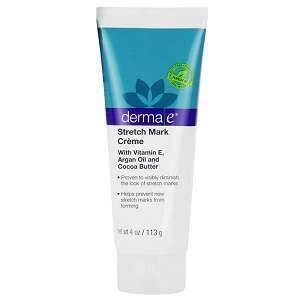 Overall the Derma E Stretch Mark Creme seems to have it all. The ingredients are state-of-the-art in natural cosmetics, the price is impressive, and they even guarantee the item for your satisfaction. This product is worth a go for anyone looking for a great stretch mark cream, the only exception perhaps being for those with long term problems. As with any creams that you see with water / aqua / purified water as the first ingredient, the formula is diluted to be delicate and for use in pregnancy. If you suffer from really severe existing marks, perhaps something slightly more potent could be recommended. Unfortunately their guarantee window is fairly small too. David Carney	reviewed Derma E Stretch Mark Creme	on August 4th	 and gave it a rating of 3.